For other people named Alfred Marshall, see Alfred Marshall (disambiguation). 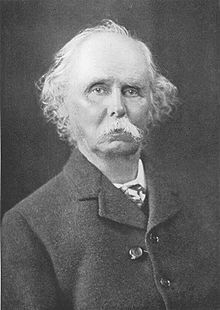 Alfred Marshall, FBA (26 July 1842 – 13 July 1924) was one of the most influential economists of his time. [according to whom?] His book, Principles of Economics (1890), was the dominant economic textbook in England for many years. It brings the ideas of supply and demand, marginal utility, and costs of production into a coherent whole. He is known as one of the founders of neoclassical economics. Although Marshall took economics to a more mathematically rigorous level, he did not want mathematics to overshadow economics and thus make economics irrelevant to the layman. Marshall was born in London. His father was a bank cashier and devout Evangelical. Marshall grew up in Clapham and was educated at the Merchant Taylors' School and St John's College, Cambridge, where he demonstrated an aptitude in mathematics, achieving the rank of Second Wrangler in the 1865 Cambridge Mathematical Tripos. Marshall experienced a mental crisis that led him to abandon physics and switch to philosophy. He began with metaphysics, specifically "the philosophical foundation of knowledge, especially in relation to theology.". Metaphysics led Marshall to ethics, specifically a Sidgwickian version of utilitarianism; ethics, in turn, led him to economics, because economics played an essential role in providing the preconditions for the improvement of the working class. 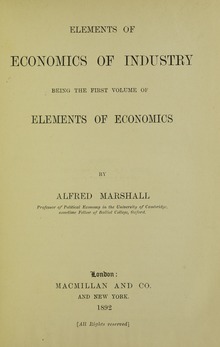 He saw that the duty of economics was to improve material conditions, but such improvement would occur, Marshall believed, only in connection with social and political forces. His interest in Georgism, liberalism, socialism, trade unions, women's education, poverty and progress reflect the influence of his early social philosophy on his later activities and writings. Marshall was elected in 1865 to a fellowship at St John's College at Cambridge, and became lecturer in the moral sciences in 1868. In 1885 he became professor of political economy at Cambridge, where he remained until his retirement in 1908. Over the years he interacted with many British thinkers including Henry Sidgwick, W.K. Clifford, Benjamin Jowett, William Stanley Jevons, Francis Ysidro Edgeworth, John Neville Keynes and John Maynard Keynes. Marshall founded the Cambridge School which paid special attention to increasing returns, the theory of the firm, and welfare economics; after his retirement leaderships passed to Arthur Cecil Pigou and John Maynard Keynes. (1) Use mathematics as shorthand language, rather than as an engine of inquiry. (2) Keep to them till you have done. (3) Translate into English. (4) Then illustrate by examples that are important in real life (5) Burn the mathematics. (6) If you can't succeed in 4, burn 3. This I do often." Marshall had been Mary Paley's professor of political economy at Cambridge and the two were married in 1877, forcing Marshall to leave his position as a Fellow of St John's College, Cambridge to comply with celibacy rules at the university. He became the first principal at University College, Bristol, which was the institution that later became the University of Bristol, again lecturing on political economy and economics. He perfected his Economics of Industry while at Bristol, and published it more widely in England as an economic curriculum; its simple form stood upon sophisticated theoretical foundations. Marshall achieved a measure of fame from this work, and upon the death of William Jevons in 1882, Marshall became the leading British economist of the scientific school of his time. Principles of Economics established his worldwide reputation. It appeared in 8 editions, starting at 750 pages and growing to 870 pages. It decisively shaped the teaching of economics in English-speaking countries. Its main technical contribution was a masterful analysis of the issues of elasticity, consumer surplus, increasing and diminishing returns, short and long terms, and marginal utility. Many of the ideas were original with Marshall; others were improved versions of the ideas by W. S. Jevons and others. In a broader sense Marshall hoped to reconcile the classical and modern theories of value. John Stuart Mill had examined the relationship between the value of commodities and their production costs, on the theory that value depends on the effort expended in manufacture. Jevons and the Marginal Utility theorists had elaborated a theory of value based on the idea of maximising utility, holding that value depends on demand. Marshall's work used both these approaches, but he focused more on costs. He noted that, in the short run, supply cannot be changed and market value depends mainly on demand. In an intermediate time period, production can be expanded by existing facilities, such as buildings and machinery, but, since these do not require renewal within this intermediate period, their costs (called fixed, overhead, or supplementary costs) have little influence on the sale price of the product. Marshall pointed out that it is the prime or variable costs, which constantly recur, that influence the sale price most in this period. In a still longer period, machines and buildings wear out and have to be replaced, so that the sale price of the product must be high enough to cover such replacement costs. This classification of costs into fixed and variable and the emphasis given to the element of time probably represent one of Marshall's chief contributions to economic theory. He was committed to partial equilibrium models over general equilibrium on the grounds that the inherently dynamical nature of economics made the former more practically useful. Alfred Marshall's supply and demand graph. Much of the success of Marshall's teaching and Principles book derived from his effective use of diagrams, which were soon emulated by other teachers worldwide. 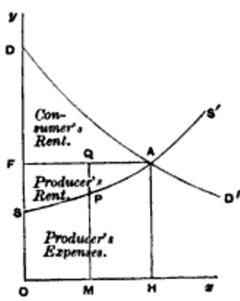 Alfred Marshall was the first to develop the standard supply and demand graph demonstrating a number of fundamentals regarding supply and demand including the supply and demand curves, market equilibrium, the relationship between quantity and price in regards to supply and demand, the law of marginal utility, the law of diminishing returns, and the ideas of consumer and producer surpluses. This model is now used by economists in various forms using different variables to demonstrate several other economic principles. Marshall's model allowed a visual representation of complex economic fundamentals where before all the ideas and theories were only capable of being explained through words. These models are now critical throughout the study of economics because they allow a clear and concise representation of the fundamentals or theories being explained. Marshall is considered to be one of the most influential economists of his time, largely shaping mainstream economic thought for the next fifty years, and being one of the founders of the school of neoclassical economics. Although his economics was advertised as extensions and refinements of the work of Adam Smith, David Ricardo, Thomas Robert Malthus and John Stuart Mill, he extended economics away from its classical focus on the market economy and instead popularised it as a study of human behaviour. He downplayed the contributions of certain other economists to his work, such as Léon Walras, Vilfredo Pareto and Jules Dupuit, and only grudgingly acknowledged the influence of Stanley Jevons himself. Marshall was one of those who used utility analysis, but not as a theory of value. He used it as a part of the theory to explain demand curves and the principle of substitution. Marshall's scissors analysis – which combined demand and supply, that is, utility and cost of production, as if in the two blades of a pair of scissors – effectively removed the theory of value from the center of analysis and replaced it with the theory of price. While the term "value" continued to be used, for most people it was a synonym for "price". Prices no longer were thought to gravitate toward some ultimate and absolute basis of price; prices were existential, between the relationship of demand and supply. Marshall's influence on codifying economic thought is difficult to deny. He popularised the use of supply and demand functions as tools of price determination (previously discovered independently by Cournot); modern economists owe the linkage between price shifts and curve shifts to Marshall. Marshall was an important part of the "marginalist revolution;" the idea that consumers attempt to adjust consumption until marginal utility equals the price was another of his contributions. The price elasticity of demand was presented by Marshall as an extension of these ideas. Economic welfare, divided into producer surplus and consumer surplus, was contributed by Marshall, and indeed, the two are sometimes described eponymously as 'Marshallian surplus.' He used this idea of surplus to rigorously analyse the effect of taxes and price shifts on market welfare. Marshall also identified quasi-rents. Marshall's brief references to the social and cultural relations in the "industrial districts" of England were used as a starting point for late twentieth-century work in economic geography and institutional economics on clustering and learning organisations. Another contribution that Marshall made was differentiating concepts of internal and external economies of scale. That is that when costs of input factors of production go down, it is a positive externality for all the firms in the market place, outside the control of any of the firms. A concept based on a pattern of organisation that was common in late nineteenth century Britain in which firms concentrating on the manufacture of certain products were geographically clustered. Comments made by Marshall in Book 4, Chapter 10 of Principles of Economics have been used by economists and economic geographers to discuss this phenomenon. The two dominant characteristics of a Marshallian industrial district are high degrees of vertical and horizontal specialisation and a very heavy reliance on market mechanism for exchange. Firms tend to be small and to focus on a single function in the production chain. Firms located in industrial districts are highly competitive in the neoclassical sense, and in many cases there is little product differentiation. The major advantages of Marshallian industrial districts arise from simple propinquity of firms, which allows easier recruitment of skilled labour and rapid exchanges of commercial and technical information through informal channels. They illustrate competitive capitalism at its most efficient, with transaction costs reduced to a practical minimum, but they are feasible only when economies of scale are limited. Over the next two decades he worked to complete the second volume of his Principles, but his unyielding attention to detail and ambition for completeness prevented him from mastering the work's breadth. The work was never finished and many other, lesser works he had begun work on – a memorandum on trade policy for the Chancellor of the Exchequer in the 1890s, for instance – were left incomplete for the same reasons. Marshall died aged 81 at his home in Cambridge and is buried in the Ascension Parish Burial Ground. The library of the Department of Economics at Cambridge University (The Marshall Library of Economics), the Economics society at Cambridge (The Marshall Society) as well as the University of Bristol Economics department are named after him. His archive is available for consultation by appointment at the Marshall Library of Economics. Alfred Marshall's wife was Mary Paley, co-founder of Newnham College; she continued to live in Balliol Croft until her death in 1944; her ashes were scattered in the garden. ^ "Alfred Marshall". economics.illinoisstate.edu. Archived from the original on 7 November 2016. Retrieved 1 June 2017. ^ "Marshall, Alfred (MRSL861A)". A Cambridge Alumni Database. University of Cambridge. ^ McWilliams Tullberg (May 2008). "Alfred Marshall (1896-2019)". Oxford Dictionary of National Biography, OUP. doi:10.1093/ref:odnb/34893. Retrieved 25 April 2008. ^ Dimand, Robert W. (2007). "Keynes, IS-LM, and the Marshallian Tradition". History of Political Economy. Duke University Press. 39 (1): 81–95. doi:10.1215/00182702-2006-024. ^ "External Economies of Scale". Investopedia. ^ Alfred Marshall y la teoría económica del empresario, Jesus M. Zaratiegui Archived 12 September 2010 at the Wayback Machine . ^ A finding aid to his materials is available at "Marshall Library Archives - Overview". ^ "Lucy Cavendish College Site and Buildings" (PDF). Archived from the original (PDF) on 27 September 2011. Cook, Simon J. "Race and Nation in Marshall's Histories." European Journal of the History of Economic Thought 2013 20(6): 940–956. Parsons, Talcott. "The Structure of Social Action." (1937), Chapter IV. Narmadeshwar Jha, The Age of Marshall: Aspects of British Economic Thought – 1890–1915. London: F. Cass, 1973. Raffaelli, Tiziano et al. The Elgar Companion to Alfred Marshall 2006. 752 ISBN 1-84376-072-X. Wikisource has the text of a 1922 Encyclopædia Britannica article about Alfred Marshall. "Marshall, Alfred" . Encyclopedia Americana. 1920.